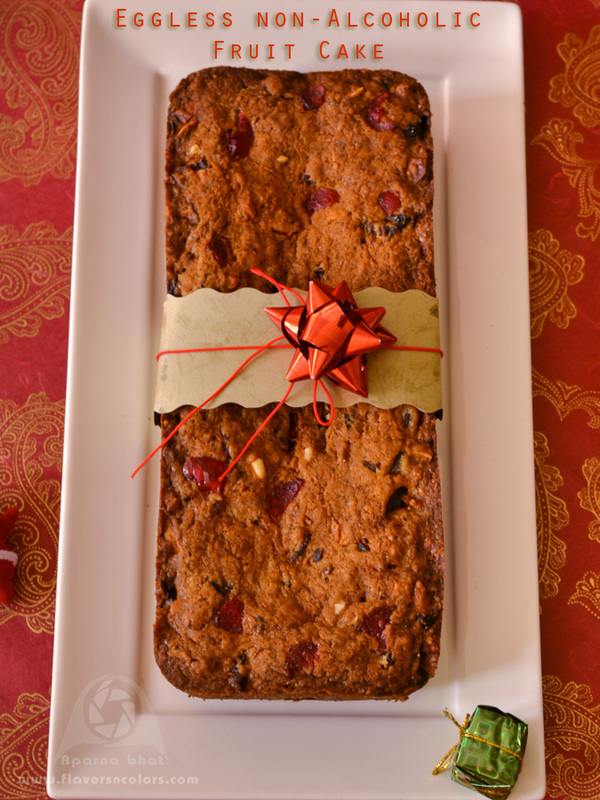 Eggless Non-Alcoholic Fruit Cake - Merry Christmas ! 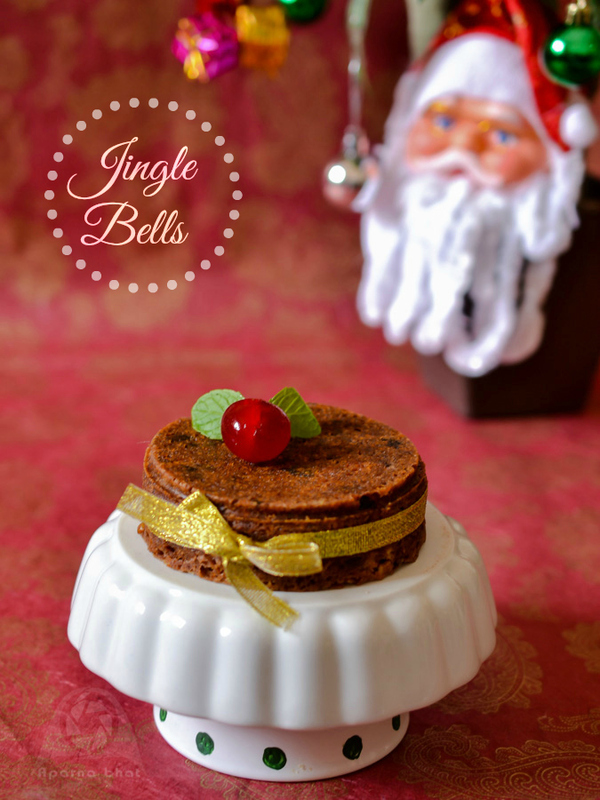 Christmas fruit cake is a 'must have' cake for holiday celebrations. It was always a wish to bake this cake but my understanding that the dry fruits which are integral part of it needs soaking in rum/ brandy, so till date I never made an attempt. Few days back I came across Cheryl's recipe on baking group. She had mentioned using non-alcoholic substitute for soaking fruits. That led me to hunt for other recipes which used non-alcoholic substitutes like apple juice, orange juice. I followed Cheryl's tip of using grape juice because as per her tips grape juice is good alternative to brandy. 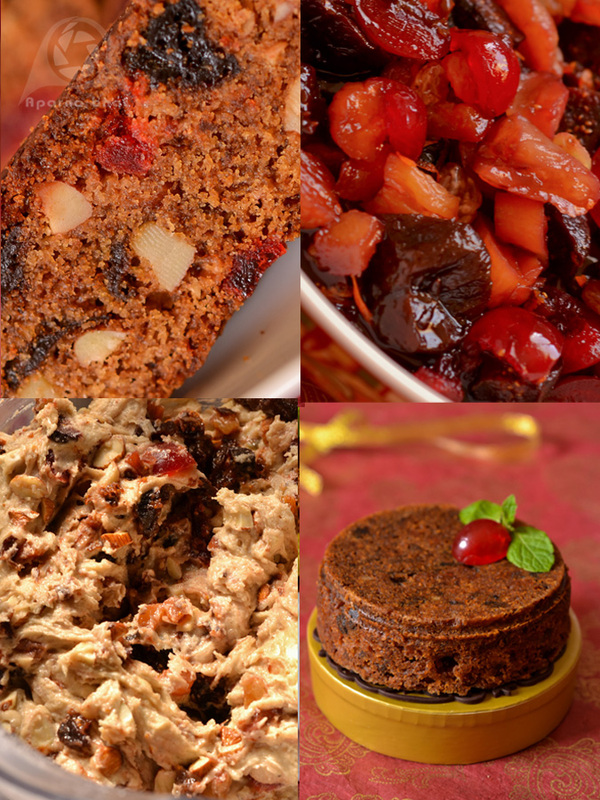 Below recipe is loosely adapted from here but before that you can check Cheryl's page for Christmas Fruit Cake - tips and more and then proceed with baking this cake instantly. Roughly chop the dry fruits. Add chopped dry fruits,raisins, fresh orange rind and grapes juice in a bowl. Mix well and leave it to stand for overnight. You may soak them for 2-3 days for better results [I did it] but you need to keep it refrigerated until you use them. Grind the mentioned whole spices to powder form. Keep it aside. Gently roast the nuts, chop them roughly and keep them aside. 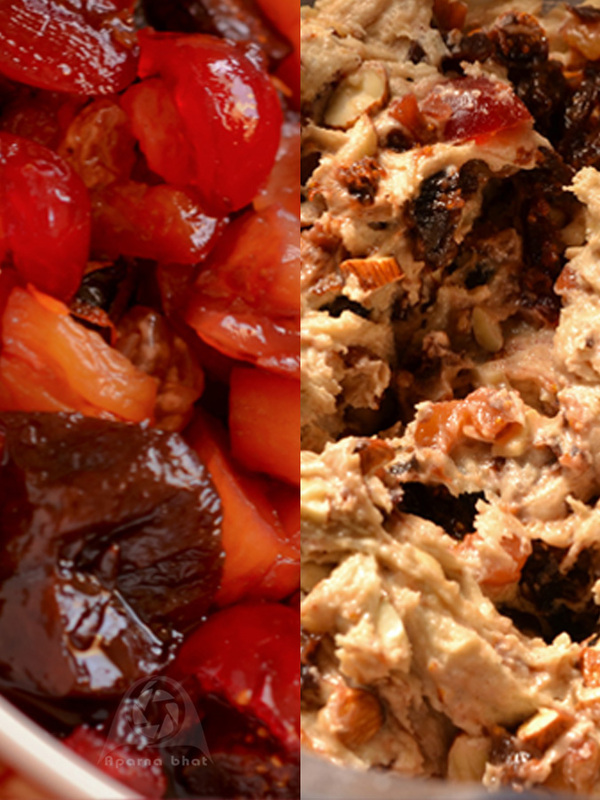 I have used walnuts, almonds, and cashews. Drain the dry fruits and keep the remaining juice aside. Bring it to room temperature before baking the cake. Sieve baking powder, flour and salt to get evenly mixed. Keep it aside. In another bowl cream the butter with brown sugar until light and fluffy. Now slowly add dry ingredients to butter sugar mixture and fold through with spatula until the flour is well incorporated. Do not overmix. Add remaining juice, caramel, spice powder, vanilla essence and blend well. Sprinkle 2 tbsp flour over nuts as well as soaked and drained dry fruits. Fold them lightly into the cake mix. Dissolve baking soda in vinegar and quickly pour the mixture over the cake batter and fold it gently. The mixture will be thick but don't worry. Preheat the oven to 180 degrees C. Meanwhile grease and dust or line the cake pans/ tins. Spoon the cake batter into the pan and level it smooth with back of spoon or spatula. Place the cake pan in the middle shelf of oven and bake it for 50 min or until the cake is done [test with toothpick test]. Remove from oven after 5 mins and cool it on wire rack. Allow the cake to cool completely before slicing. You may use orange juice or apple juice instead of grape juice. You may replace dry fruits and nuts as per your choice and availability. You may dust the cake it with icing sugar or decorate it with fondant.